All images by Paula Kopylowicz / Exploder, more at Exploder fb. 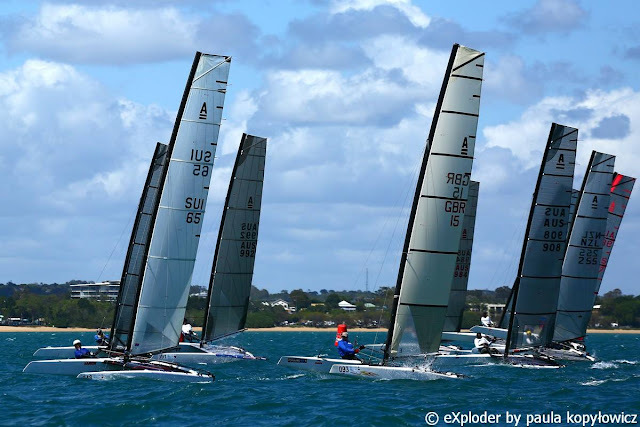 Aus Nats are the pre event for the Worlds next week. 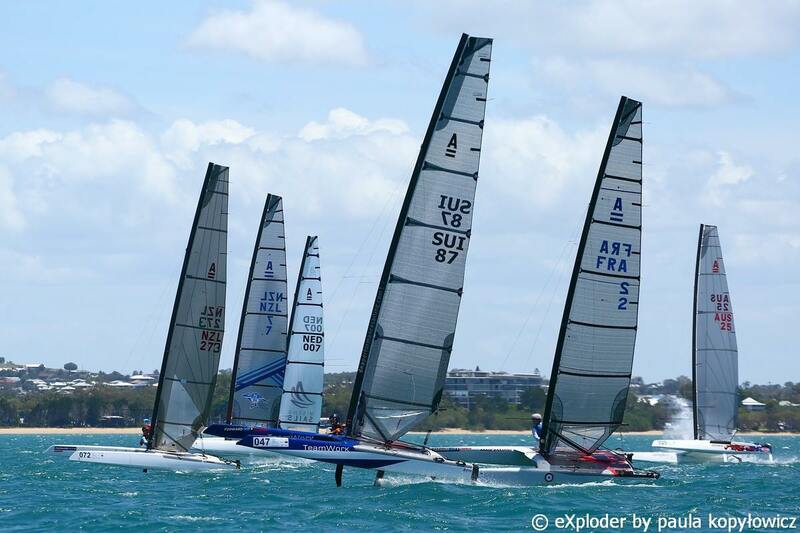 Already on the first two regattas the favorites confirmed their intentions. For a change Ashby (D3/North) won the two races held today. Great to see Bundock (D3/Brewin) in good shape finishing 2 & 4. Mischa (F1x/Mischa) seems to have found pace finally (from the Europeans 2018) and scored 6 & 2. Brewin follows, Brayshaw & Burling. Blair got a 4 and a dnf. In the Classics Division Andrew Landenberger (D3 Classic/Landenberger) lead with three bullets (the Classics have their races before the Open division). Scott Anderson finished 2nd and Alberto Farnesi 3rd in all three races. More info later when available from local reports. Ben Hall: "Due to the forecast, the race committee sent the Classics out for a 9:30 start. Breeze was fully on at the start with the wind ranging from 15-20 kts. They scheduled three races and were able to complete all three in a building breeze...puffs of 22 kts were making it quite challenging. Landy won all three races with Scott Anderson battling Landy all the way with three seconds. Next was Alberto Farnesi, the big Swede sailing a Marstrom. He just put the bow down and sent it. I had a tough first race...while in fourth place I capsized going upwind...huge puff and huge header put me over to weather. So I started with a 23rd. Next two races I finished 7, 5...not so bad for the oldest guy in the fleet. Tomorrow promises to be much lighter so the Nikita should like that. Landy and Scottie sailed the new Exploder Classic which seemed to like the heavy conditions...oh I almost forgot...they are Aussies! Next up were the Foilers (don’t know why they call it the Open class). 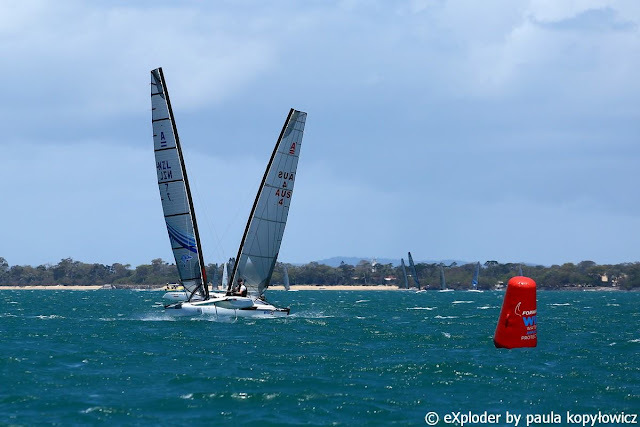 They sailed the same course as the Classics but the breeze was still building. 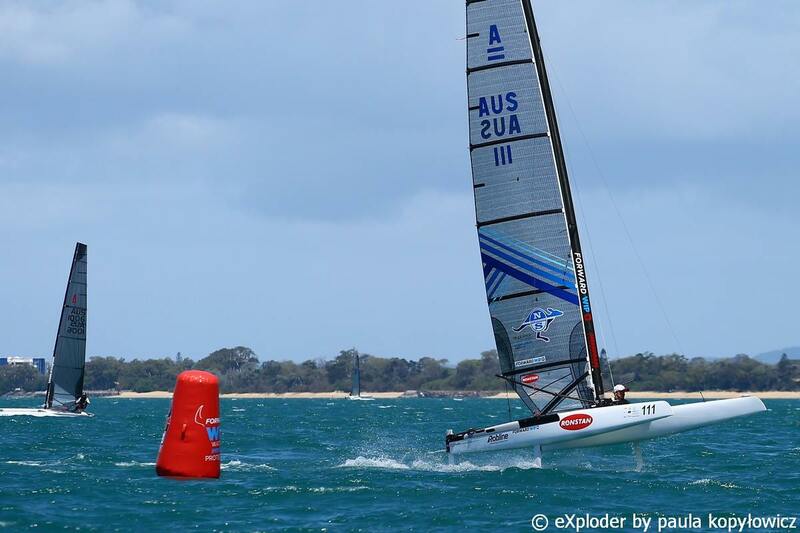 Glenn won the first race ( surprise ,surprise) with Bundy second, Burling third and Blair Tuke fourth. I asked Bundy how close he was to Glenn...”I could still read his numbers”...not bad. Many of the sailors I talked to were on the edge of disaster both upwind and down. The puffs were ferocious and on top of that it was really shifty. 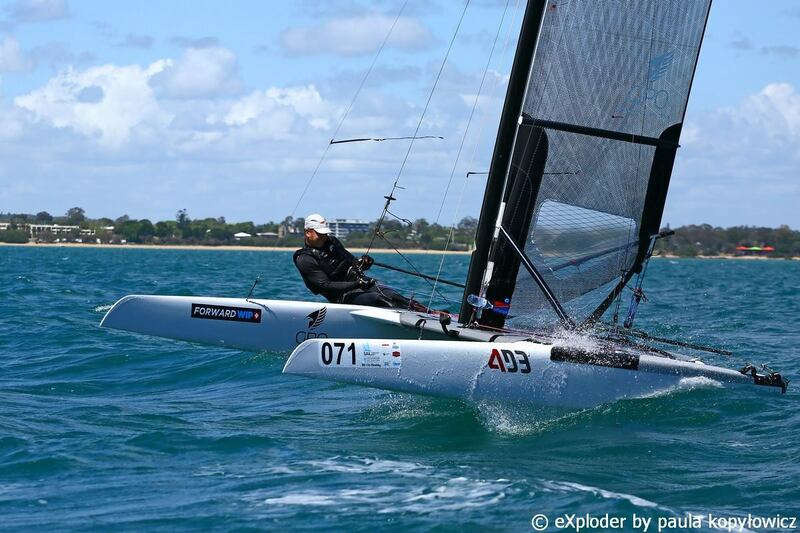 Upwind foiling has become the norm with the top of the fleet. 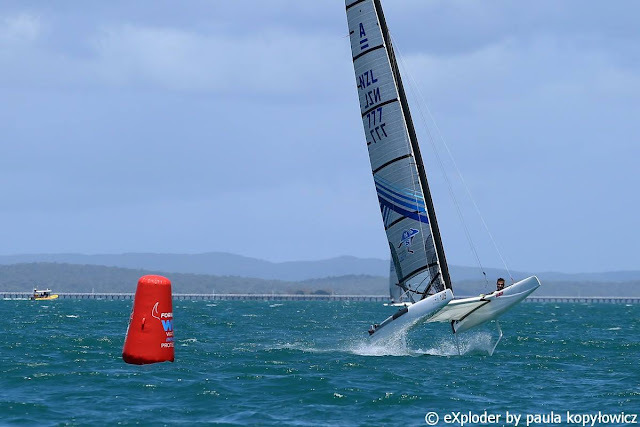 Mischa reported that his speed would jump from 14 kts to about 22 once fully foiling...that translates to about 45 kts apparent...wow! The second race was even windier with gusts up around 28 kts. The race committee decided to stop the race at the top mark of the second lap. Glenn won again with Mischa second and Stevie Brewin 3rd and Bundy fourth. Americans Bruce Mahoney and Matt Keenan did not sail either race due to boats that were totally new to them and ones they did not own...as Bruce put it he did not want to “hit the wall” with Glenn’s F1 rocket ship. Carolijn Brouwer aptly put it...”I was was pretty much in survival mode all day”...she wasn’t the only one. But watch out for her tomorrow boys when the wind drops down. Tomorrow will revert to the original schedule with two separate races courses and a start at 11 am.